One of the Accidental Locavore’s favorite meals, especially in the summer when you don’t feel like applying any more heat, is steak tartare. It’s really like making hamburgers, meatballs, or meatloaf, except there’s no cooking involved. For two really hungry people. 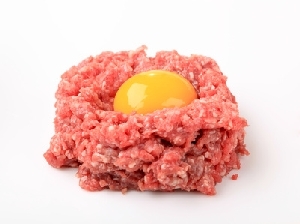 Tell your butcher that you’re making steak tartare, and have him grind 3/4 of a pound of steak. Choose something lean, this is not where you need to be grinding up a rib eye. I just did some with local Black Angus sirloin, and it was great. This is what I usually put in it, but the ingredients are up to you. An egg (since we buy jumbo eggs, the best thing is to put an egg into a small dish, beat it just to combine it, and pour in enough to bind the meat). Mix it until combined, serve and enjoy! If you’ve made steak tartare, what do you add that isn’t on my list? What Does a Locavore Eat in the South of France? Accidental Locavore: Top Three Food Magazines II: Paper or Electrons?